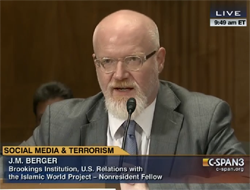 Several stories have noted the impact of the Rabia massacre on Islamist and/or jihadist movements, including the rise of a four-fingered hand gesture as a symbol and invocation of the atrocity. One small but vivid window onto the impact of the massacre is the widespread adoption of the Rabia icon as an avatar by Twitter users. The image above shows the avatars of a sampling of users who tweeted the Arabic hashtag for jihad on August 21 and 22. 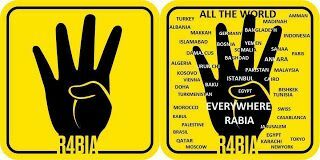 Compare the number of Rabia symbols -- mostly in black and yellow -- to the number of black flags (click the image for a much larger version). Also visible in black and yellow are chemical hazard symbols, which began sprouting after the alleged chemical attack in Ghouta. By today, August 23, there was a notable increase in the percentage of both symbols. Narrowing in on explicitly jihadist Twitter networks (in this case, Al Qaeda in Iraq and the Levant), the colors' frequency was quite high on August 18 and 19, immediately after the Ghouta attack. However it appeared slightly less prevalent for avatars collected today, with the black flags mounting a comeback. This may be due in part to fluctuations among posts from actual Al Qaeda members versus less engaged people and jihobbyists posting in relation to the chemical attacks.